A continuous casting is the process of casting metal into endless length of strips or slabs which can be further shaped into suitable products. Though the process may sound simple, it a complex metallurgical process. The continuous solidification and withdrawal from a shaping mould involves thermal and mechanical interactions between the mould and the moving solidifying metal. Today casting plants are using large-scale production of continuous cast and rolled strip in aluminum, copper, lead and zinc. Design of Machines: The molten metal enters the mould, solidifies and comes out from the sides as continuous strips. 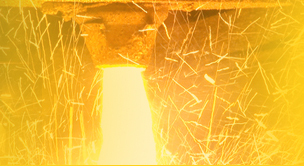 The primary factor for the proper functioning of a continuous casting is the faultless heat transfer within the mold. Though the process sounds simple, the solidified metal can come out as one strip only if some parameter is satisfied. The gauge for coiling or rolling the strips can be place next to the casting machine. In this way the production can be continued without interruption. 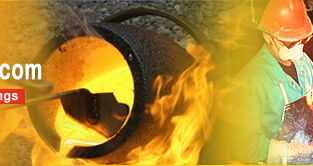 Applications: Continuous casting is rapidly getting used for steel casting. In 2003 nearly 32% of the steel bars were produced by continuous casting. The vertical cast can be used forsemi-continuous casting like billets, ingots, bars, etc. Advantages: Continuous casting helps in saving many steps that would be required in the convention casting technologies. Therefore, capital investment and the cost of operation can be reduced substantially. The seven step of conventional casting process is reduced to five steps in the continuous casting method.